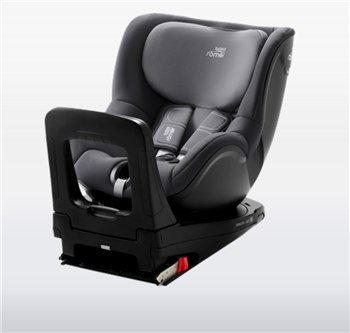 The new Dualfix i-Size, produced by our partner Britax Römer, is a child seat that you can use to safely carry your child in your car from when they are a baby until they are four years old. This high-quality product was recently released on the market. After our first joint project, a bicycle seat, Rompa now manufactures the majority of the plastic components for the Dualfix i-Size. Read more about the ins and outs of this product and learn about its development and production process. The Dualfix i-Size is an innovative product that meets the latest European safety standard for children’s car seats (ECE-R129). For example, the seat features optimised sideways collision protection. It can also be flexibly adjusted to fit children of different lengths and it can rotate 360°, which means babies can be carried facing backwards for longer (until they are at least fifteen months). This is the safest method to transport children in a car. According to the Dutch Consumentenbond, the forces on a child’s neck are five times lower in the event of a head-on collision when the child is carried in this position. The collaboration is going exceptionally well. Every week, Rompa produces several thousand complete sets. “In addition to the injection moulding process, we also handle subassembly and the printing of some of the components,” Martijn explains.